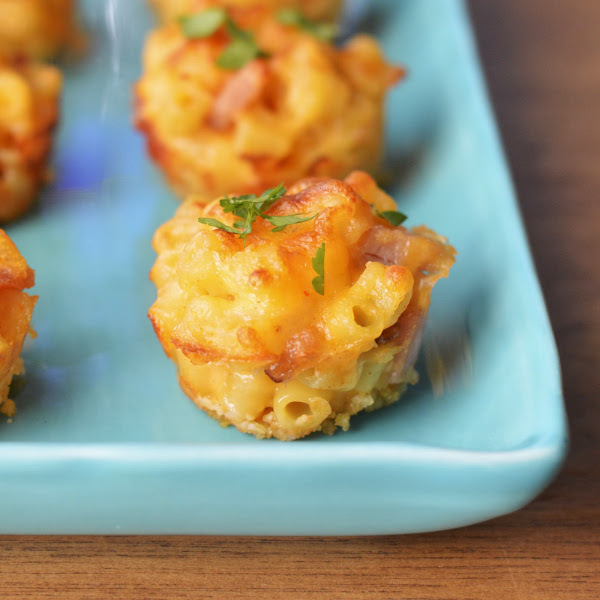 Mac and Cheese Bites. Homemade macaroni and cheese, no utensils required. Mini Caramel Apples. 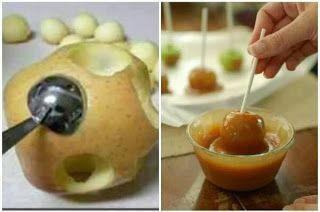 Hollow out a peeled apple with a melon baller, insert a stick, and dip in caramel. 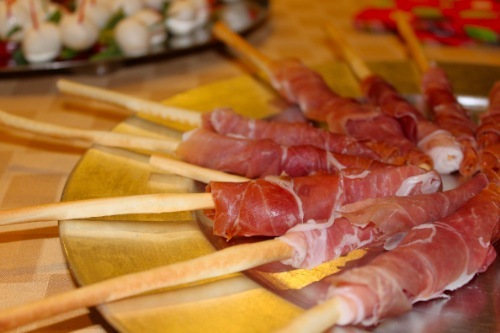 Prosciutto-Wrapped Bread Sticks. Wrap prosciutto around a breadstick–how can you go wrong? Greek Salad Appetizers. 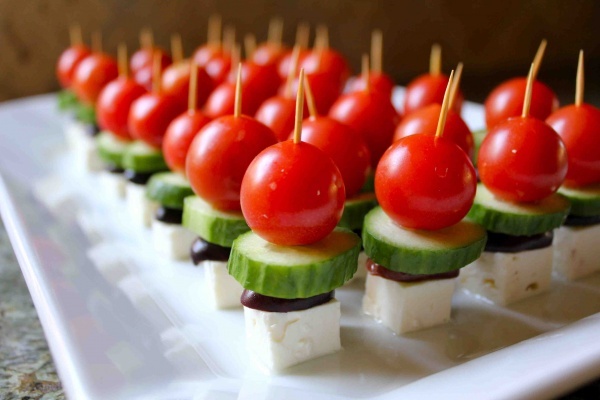 Feta cheese, olives, cucumbers, and tomatoes on a toothpick. 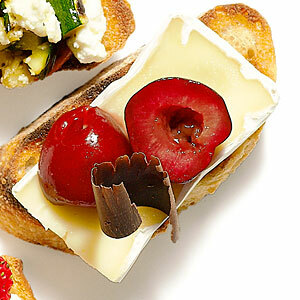 Beets and Preserved Lemon Bruschetta. 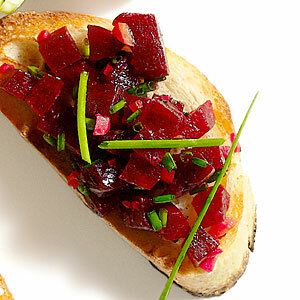 Salt-cured preserved lemon, roasted beets, and chives on grilled toasts brushed with olive oil. 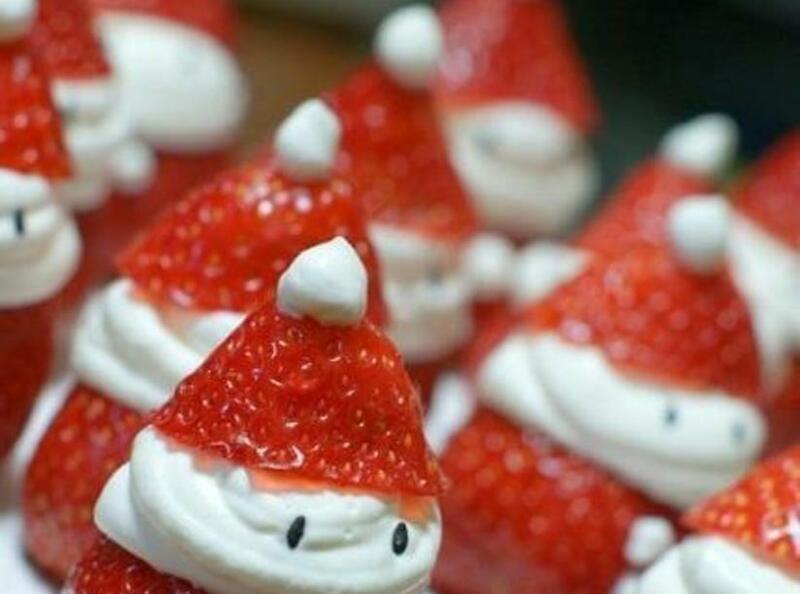 Strawberry Santas. The strawberries are Santa Claus’s hat and body, sweetened whip cream for his face and the top of the hat, and chocolate sprinkles are the eyes. Caprese Salad Appetizer. 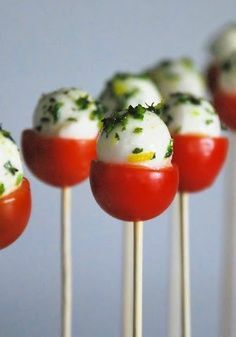 Hollow out cherry tomatoes, put mozzarella cheese balls inside, add some basil, and stick them on a toothpick. Drizzle with a touch of olive oil. I made the santas for a children’s party at my office. The chocolate sprinkles ooze into the whipped cream if you do them ahead of time. It looks kind-of creepy too. Try only to do those the day of your party. Love the mac’n'cheese bites and mini caramel apples though! Thanks for the tip, Joelle. It explains why the “eyes” in the picture look like sesame seeds and not sprinkles.